Now I wouldn’t be one for having a regular facial (every 6-8 weeks is the norm) but I do have a lot more than I had in my twenties. Every few months I treat myself to one and they are always divine and leave me feeling and looking so much fresher and revived. As most of you know, my real job is at Town & Country Mercantile in New Ross and in February of this year we opened a fabulous beauty salon called The Beauty Parlour on the top floor of our fashion and lifestyle store. It’s going from strength to strength since then and the girls are introducing exciting new treatments every other week. So when the manager asked me if I wanted a fab facial in exchange for a review, I accepted immediately. Like as if I was going to say no! 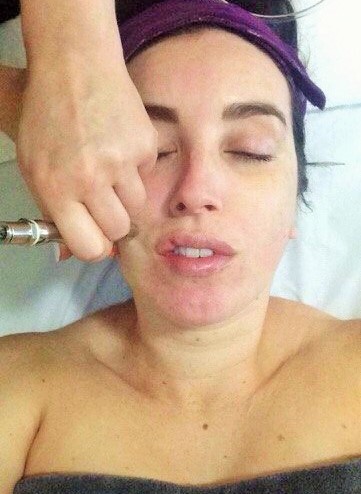 I then spoke to one of our beauty therapists Abby about what facial was suitable for me, as she was going to be using a machine, not all those kind of facials are safe during pregnancy. So after a little bit of research, the appropriate facial for me and my skin was a Diamond Microdermabrasion Facial followed by a collagen mask (an extra add on). My T-Zone is generally quite red, with my nose and chin being the most affected areas. It’s something I really hate and if I’m going barefaced on my day off I normally apply some camouflage cream to tone down those areas. So having a Diamond Microdermabrasion Facial seemed ideal for me. This kind of facial is a deep exfoliation, where tiny crystals are sprayed onto the skin to gently remove the outer layer of skin. It restores the skins texture and leaves it feeling smooth and bright. It’s suitable for most skin types as it is non invasive and works effectively to soften fine lines, reduce acne scars, age spots and open pores. I was super excited about having an hour to myself to relax and treat my skin to some pampering. Being pregnant for a second time is very different to before. Working four day’s a week and looking after my four year old, there isn’t much free time to myself these day’s so I appreciate any minute I can get to myself before baby no.2 arrives. The Beauty Parlour is beautifully laid out with stunning decor and that for me makes having a treatment feel alot more special and relaxing. As beauty therapist Abby began the treatment, she cleansed my face, and then sprayed the crystals onto my skin with the peeling pen in single line motions. It felt like delicate sandpaper hoovering my skin (and that isn’t a bad thing)! I did say to Abby to work extra on my chin as that is my reddest area. So with that, she upped the anti by putting a stronger strip on the pen and focused solely on my chin. Once every inch of my face and neck had been done Abby told me to have a feel of my face. Instantly I felt it was smoother, I was thrilled! 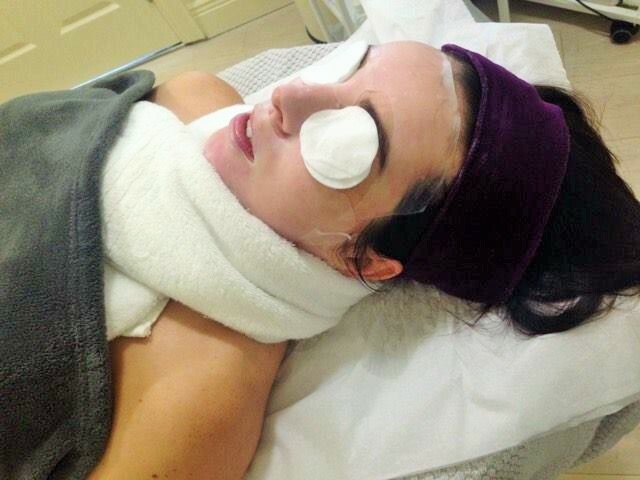 She then applied a collagen mask to soothe and tone my skin after the Microdermabrasion Facial. The mask itself is like stiff white paper but once water is applied it turns into a silky like material and relaxes onto the skin. The water releases the collagen in the mask and it’s left on the face for twenty minutes to work it’s magic. After a relaxing twenty minutes, the mask was peeled off and my skin felt soft and supple. I didn’t know what to expect when I looked in the mirror but I was pleasantly surprised. I wasn’t as red as I expected to be, I was glowing actually and I noticed the lines on my forehead were less visible, the rough uneven feel on my chin was actually gone completely. For me that was very important. I was kind of kicking myself for not having it done sooner! A week on from having the facial I noticed my skin is still glowing, even more so when I’m wearing my makeup. I’m a girl that wears makeup most day’s so for me it’s important that it’s not just stuck on my face. Having good skin underneath means makeup looks a hundred times better! I plan on having another Diamond Microdermabrasion Facial before baby arrives. My chin is still slightly red so I want to keep having the facials to help with that. I reckon twice more will help it alot. I’m visualizing all those post birth hospital photos – I’m totally fine wearing no makeup in them but having good skin would make them all the better!!! ***Disclaimer*** I received this facial free of charge in exchange for a review. All opinions are my own. For more information on this facial contact The Beauty Parlour at Town & Country Mercantile. Click the link above! Information you provided was very helpful,Microdermabrasion Facial seemed ideal and after the facial the skin start glowing, thanks for such a awesome blog.